Basically each student had to choose a word from a list given by the OCR exam board (for art subjects only). They’re actually our subjects for the exam; once we’ve chosen a word, we’ll have to interpret it in our own words, create a workbook full of researches and samples, and a textile garment. Amongst many confusing words which I had no idea what they meant, I chose “Facade” (which I didn’t know what it meant either). There are 2 meanings for “facade”: a building’s frontage & a deceptive appearance. For me, the second one has more potential to develop into a textile piece. But of course, I had to look at both meaning to be able to create as much sample as I could. After making many researches and samples, I started to create a design. This is actually my first sketch for this piece. Anyway the idea was portraying “a deceptive appearance” – one of the meanings of “facade”, and I thought the “angel-devil” concept fit brilliantly. So I gave it a try anyway, without changing any detail of my sketch. 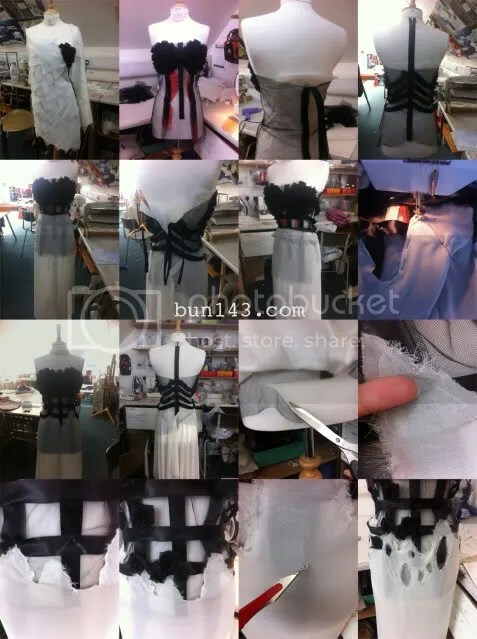 I had to brought all the materials to the college and made the dress in 15 hours (3 days, 5 hours each). I definitely had a hard time making this since I have never been taught how to sew or make a pattern. I couldn’t buy ready-made pattern either even if I want to. 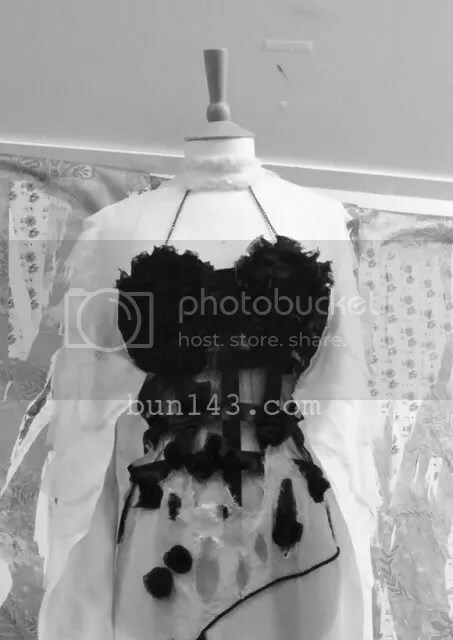 I had to made the dress entirely mannequin based. 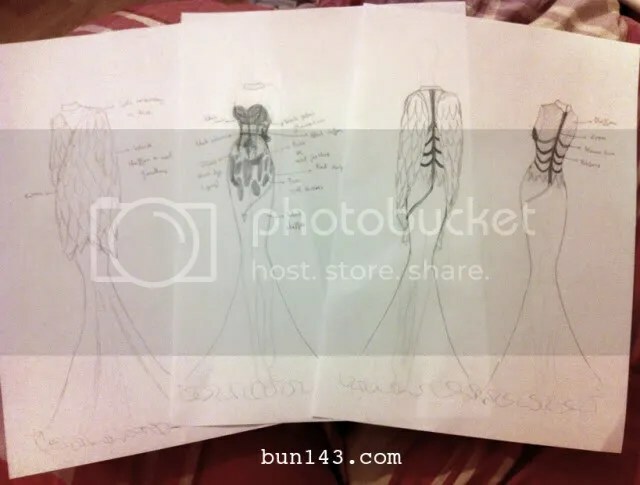 This dress has an outer coat made from layers and layers of white chiffon, hand-cut into feather shape strips (the coat is the angel’s pure white wings that deceive people’s eyes). 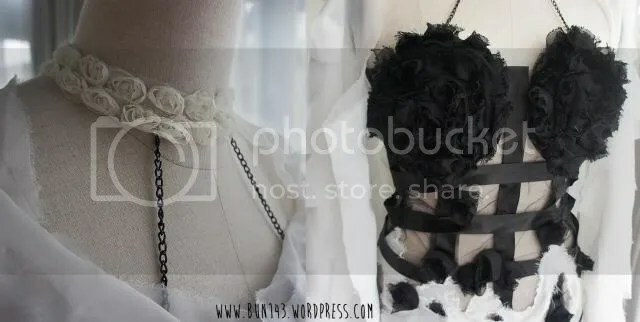 It covers the entire bodice, which was made from black tulle, portraying the rotten soul of this angel; I tried to mimic a corset frame using black ribbons (the chest was made from fabric flower strips). 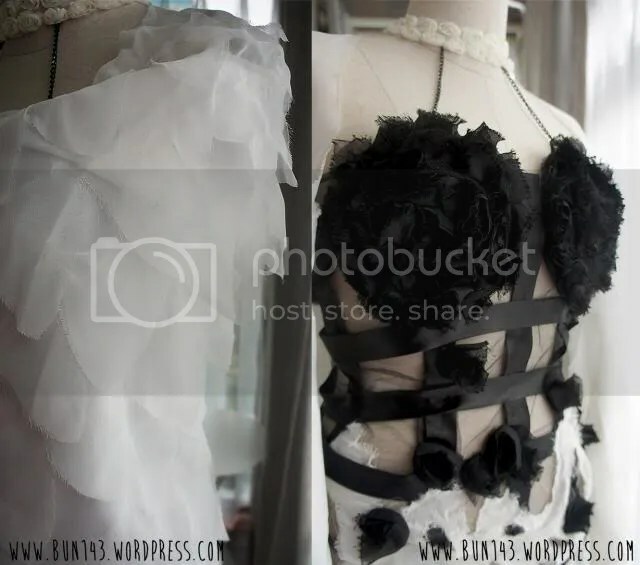 The back was made to look like a skeleton, I think it’s something that can easily reminds us of devils. And the final touch up was the devil tail, made from a black cord and a black feather.